Hey there... well after being without internet for almost 3 weeks, I might need to take a "get to know the net" course again... it feels weird. Missed you all very much!! I'll give a big update with Christmas news and new house and all that very soon. Yesterday she asked when can she get a tattoo. Since I have 4 of my own, I can't very well tell her she can't get any. So I told her when she's 18 she can get ONE tattoo but it has to say "I love my Mom". She says...... "well in that case, I'll get only one, that says..... I love my Parents." I had to bribe the child again this morning. It's the last day of school until 12 January 2009. I'm picking her up at 12:30 and taking her for ice cream. My best friends are leaving on holiday on Sunday...... Boo hoo, sob sob, sniff sniff. I'm going to miss them terribly. 10 whole days without them. Anyone who tries to tell you to 'get a grip' will be quite surprised at your reaction -- maybe because there'll be so very much of it. Yes, you're what's commonly referred to as a loose cannon in the department of emotions these days. Better take a chaperone along. How true how true..... ek is nie lekker nie.... But this too will pass!!! I want 2008 over with. It's dragging on way too long!!! On a brighter note. 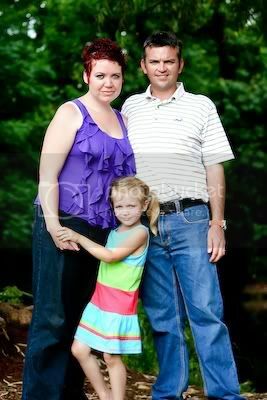 We received our family photo shoot pics this morning!! YAY!! I was a bit nervous opening them up, because I hate myself in photos. But I'm impressed. Love them. :) We so need to book a studio session with Robin. He is really really talented. McK is bunking school today. Well it's holiday program so it's not like she is missing out on much. I had to fetch her early from school yesterday because she said she had a tummy ache. So I decided to keep her at home today. She thinks I'm the greatest mom in the world for allowing her to stay at Granny's. We are going to get one last swim in, before my parents move house on Monday. I'm serving cocktails at noon, if anyone is interested in joining me?????? My prayers go out to the Muniz family this weekend. I can't believe a year has passed since C-monster joined the angels up in Heaven. I'm sure he is looking down over his baby sister and smiling! My heart aches for you. I know no words can make the pain go away. Thank you for sharing him with us, in the short time he was here. He will always be loved and missed deeply. Ash, I never knew you a year ago when your babies were taken. But your story and heartache lives within me. I admire your strength hun. You and your family are in my thoughts at this time too. Stop the world from spinning. Cease the waves from crashing. Hell tell the Sun to go shine some where else….. I have a sick DH in the house……… Some one call 911. I’m accepting all sympathy cards and flowers at my new home address. I’m thinking of asking my sister’s Journalist Boyfriend so come do an article for the newspaper. First man to get sick and live to tell the tale. And he has been warned, that eye infection better clear up by Saturday. We have a family photo shoot scheduled!!! And of course you have to love all those urgent business proposals I get from deepest darkest Africa. Claiming that I've been especially chosen to help this poor poor family and in return have claim to $25000000... I'm so popular I've been "especially chosen" almost 20 times this week already. I can give up my day job and just help these poor families....... I knew I had a calling in life. Do people actually fall for these dumb emails??? I've always seen these out and about in the blogging world. 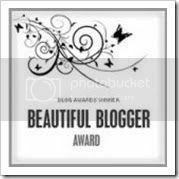 So I'm very happy to announce that my blog got nominated by Megs. 1. 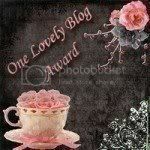 You have to pass it on to 5 other fabulous blogs in a post. 2. You have to list 5 of your fabulous addictions in the post. 3. You must copy and paste the rules and the instructions below in the post.Instructions: On your post of receiving this award, make sure you include the person that gave you the award and link it back to them. When you post your five winners, make sure you link them as well. To add the award to your post, simply right-click, save image, then "add image" it in your post as a picture so your winners can save it as well. To add it to your sidebar, add the "picture" gidget.Also, don't forget to let your winners know they won an award from you by emailing them or leaving a comment on their blog. Sorry for being MIA.... It's been a rough weekend with the move. But we are all settled in now. Exhausted but at least the place looks good. DH is being a right old @ss since Friday. McK has been crying non stop for the last 12 hours. (Yes, straight through the night, in her sleep too). She wants to move back to Granny's house. Doesn't want to live with me. Cries hysterically. Then she didn't want to go to school this morning. More crying. DH left at 5:30am this morning for a meeting in JHB. So I had to handle McK by myself. (which is maybe a good thing, cause last night all he could do was scream at her every time she cried for her granny). Anyway, the only way I could get her to go to school is when she asked me if it was her birthday today. So I said yes, I was too tired to argue with her. So then she was happy to go to school because she turned 5 today. Oh and sometime during the day I need to go drop off party packs and a cake for her……. Yes, I feel bad for bribing her. But hey, she started it. I just played along. Please let this day get better. I probably won't be much on line this week either. Oh, and I have flu to top it off with. And never mind the fact that I’m one day late……..